Heat oven to 350°F. Beat sugars, butter, vanilla and eggs until smooth. Add almond flour, cocoa, baking soda and salt. Stir to blend. Pour into greased 8 x 8 inch pan. Bake for 25 minutes or until center no longer jiggles and top feels cakey. 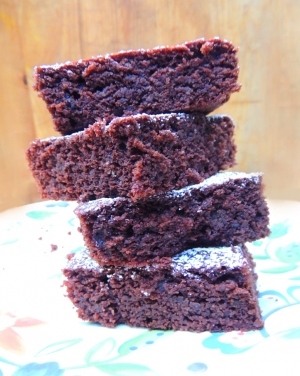 Brownies are done when a toothpick inserted in center comes out clean.